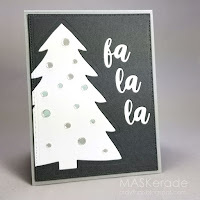 There's a Card for That: Happy Holidays Series | Watercolour Trees ft. Stampin' Up "Lovely As a Tree"
Happy Holidays Series | Watercolour Trees ft. Stampin' Up "Lovely As a Tree"
I have surprisingly few Stampin' Up sets considering how lovely they can be. I find myself very torn on them. They are either completely elegant or far too basic for my tastes. This particular set, "Lovely As a Tree" is by far one of my most favourites. The trees can be used with any palette and various mediums to create the most beautiful cards for any occasion and they are excellent for masculine cards; an area in which I struggle. This card took me a couple tries to get the way I wanted, and even then I'm sure I could play around with it some more to get it absolutely perfect. To begin, I cut down a piece of Strathmore 140lb cold press watercolour paper and put it in my MISTI. I then positioned the tall evergreen stamp starting with the far right tree. I used my Distress markers to colour directly on the stamp then spritzed it with a very fine mist of water and held the MISTI lid shut. I found that if I held it shut for about 30 seconds, the ink would transfer and give this very loose look to the image. I repeated this process with the tree on the left. I let them both dry completely then repeated it again with the tree in the middle. I stamped the greeting from Hero Arts "CL722" using the same markers as I did with the trees, but did not spritz the water. Because of the texture of the paper, I had to restamp the greeting several times to get a good solid impression. I added a piece of teal shimmering tape down the right side and popped the watercolour panel up on foam tape and adhered it to the front of a standard A2 sized card base. Depending on your preference, you could do this with any palette so long as the colours blend nicely together. You wouldn't want to use colours that would muddy up the image when the mix. Thank you all so much for your votes and support. I really cannot tell you how much it means to me. I love the look of this. I did not realize it was Lovely as a Tree. I think that must be one of their longest running sets and is, as you say, a classic! 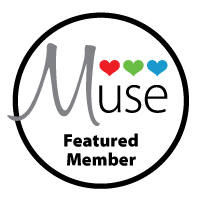 Thanks for joining us at Muse this week! This is gorgeous. I love your loose water coloring.